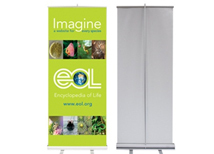 NWCI offers a complete line of retractable banners for every marketing need. 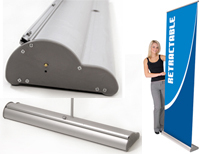 We offer economy pull up banners for companies who need a marketing tool for a few uses a year. Our premium line is designed for exhibitors who are looking for top quality products that will last show after show. 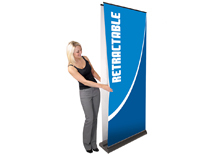 Retractable banner stands are the most popular option because of their easy "pull up" feature. 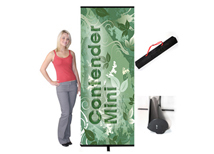 We also carry outdoor banner stands which are great for marketing outdoors and will also work in indoor applications. 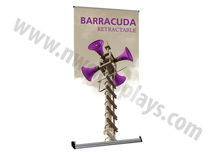 All of our retractable banners are printed on premium ANTI-CURL vinyl! 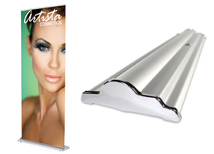 Silver Step - Best Seller! Imagine - Quick Change Graphic! 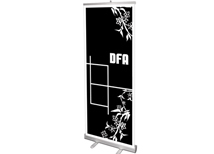 Size - 31.5" x 29.5" to 83"
Size - 35.5" x 29.5" to 83"
Retractable banner stands offer the most options of any banner stand. 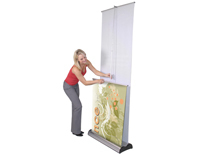 They are easy to assemble and transport while offer protection of the graphic when rolled up. 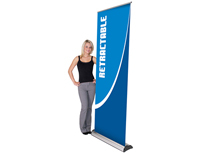 We offer some stands that are adjustable height and work as table top or full height banners. 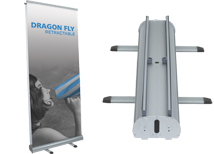 Other banners have interchangeable cartridges making it very easy to change out new graphics. 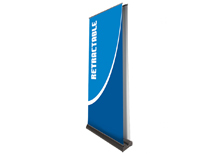 All of our retractable banners have a 3 day turnaround and can ship from various US locations! 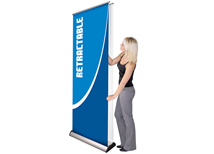 Trade show displays are a great marketing tools and banner stands are a very affordable option for any convention. 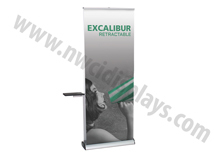 We carry banner stands that range in quality from economy to premium in order to give our customers the largest selection of products. Many shows are a one time event that requires a unique graphic display that will not be used again, while other shows will require use of the same banner over and over. 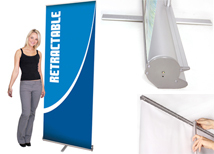 We offer banners at all price points so you can choose the best display for your needs!